We’d love your help. Let us know what’s wrong with this preview of The Massive by Brian Wood. In the pages of The Massive, the Ninth Wave was struggling to repair a broken world. But before that, they were the preeminent global environmental-rescue unit, taking on criminals, polluters, politicians, and rogue states. 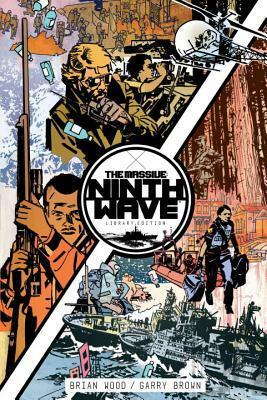 The Massive: Ninth Wave tells these stories in a stylish, high-action, done-in-one format, reuniting the entire creative team from the original series. In the pages of The Massive, the Ninth Wave was struggling to repair a broken world. But before that, they were the preeminent global environmental-rescue unit, taking on criminals, polluters, politicians, and rogue states. The Massive: Ninth Wave tells these stories in a stylish, high-action, done-in-one format, reuniting the entire creative team from the original series. Critically acclaimed writer Brian Wood and artist Garry Brown go back to the beginning with the Ninth Wave environmental action unit, sharing stories from the front lines of the eco-war. To ask other readers questions about The Massive, please sign up. When to read this book? After the main story or somewhere in-between? About a team like Green Peace that goes around stopping people from destroying the environment. Wood has created some compelling stand alone stories here. It's actually a prequel to The Massive but you don't need to know anything about the original series to enjoy this on its own. I liked it well enough that I'll be seeking The Massive out. The concept behind this was interesting: nonviolent ecoterrorists setting out to save the world one disaster at a time. And I did like how it focused not only on trees and animals, but humanitarian crises as well. But, that said, there was something lacking here. It was, at times, a little confusing and definitely overly preachy. Like, I get it, people are evil and money is the root of all evil, but I found the characters REALLY annoying and uppity and holier than thou. Eh. Great art though i didn't enjoy the story line. Great art, some of the greatest i have seen. Story, it was about a team like special forces or something that was fine but the missions where boring. If you want to fall asleep while reading this i recommend it, i thought this was going to be good like zombies or something, but it wasn't. This is a very satisfying end to the series, presenting prequel stand-alone stories to the main series. The stories flesh out the characters' histories and motivations. This volume presents a variety of takes on the world's ecological, economic, and political problems, but doesn't necessarily show things as black/white, good/evil. The artwork is excellent as it has been throughout the series. Pretty good, made me want to read the main series. This is a nice collection of vignettes that showcase the characters from the earlier series. The 30-issue run, collected into 5 volumes, of The Massive was a great series with some powerful and topical stories on ecological issues, climate change, the impact of humans on the environment, human responsibility and humanity's place within this biosphere we call home. Brian Wood did a magnificent job on the series and this collection of one-off, or one-and-done, stories is a welcome addition. I anticipated one-and-done throw-away stories in these six issue "prequel" mini series. I wasn't surprised though when Wood tied them together on a holistic level and added so much more understanding of the characters' "mission" and depth to their portrayal. Recommended reading for Massive fans. perfect eco terrorism , brutal !!!!! This collection of short stories establishes the characters in a better way than the initial run. Wish I read this first before the 30-issue run. From the 1500-page future war epic DMZ, the ecological disaster series The Massive, the American crime drama Briggs Land, the blistering youth culture action trilogy The Couriers, and the groundbreaking lo-fi dystopia Channel Zero, Wood has a proven track record of marrying socially-conscious Brian Wood's history of published work includes nearly thirty volumes of genre-spanning original material.